Bleary-eyed, my companions and I entered the Land of Mouse, ruled by a benevolent but iron-willed dictator – He Who Insists on Happiness. Visitors to this magical land are advised, nay, required to don apparel that will never be worn again outside this venue. Fortunately, I was prepared. I wore a piratical shirt that has spent the past five years residing in my closet. At last! The jaunty skull-and-crossbones (complete with sparkles) could once more fly free across my bosom. This is a clean and well-ordered land. We chose to take advantage of “early entry,” which allows access to certain rides. The younger members of our party (my son and his best friend) led us directly to Space Mountain, where we had the opportunity to scream and careen in star-filled darkness for two minutes. Note to self: perhaps do not choose rollercoasters which plunge and whipsaw at 7:20 in the morning. Our party enjoyed the various delights of the Land of Constant Felicity without too much jostling or crowding on this first day. Huzzah! I encountered fellow blogger dampscribbler at the Disneyland Railway station, she having apparently stalked me decided to vacation at the Land of Mouse, too. Yes ... it is a small world, after all. Due to the kind arrangements of a gracious host, we were even invited to dine at a secret restaurant within the park – a genuine once-in-a-lifetime experience. I insisted upon returning to our temporary abode, where we changed into appropriate attire (shirts with collars, long trousers, and closed-toe shoes). 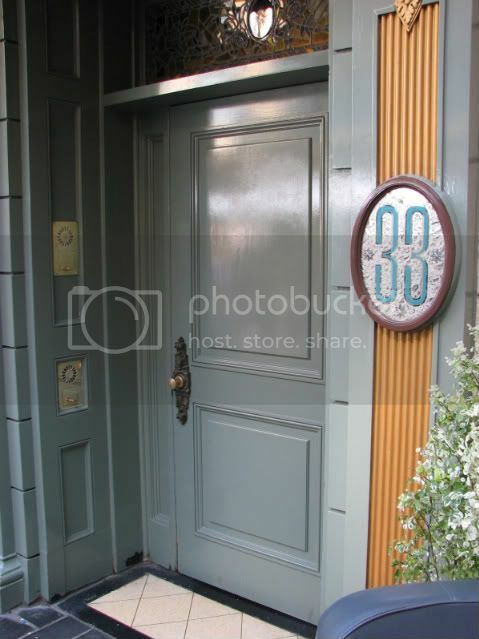 Then we made our way to the heart of the park, pressed a discreet buzzer next to the front door of the establishment, and announced the name of our party. I tell you truly: the sound of the heavy, old-fashioned lock being thrown gave me a thrill. I am sorry to report that all three members of my party refused to accompany me on one particular ride, although I gave birth to the shortest of the group, and might reasonably expect him to repay me for this service by occasionally indulging my whims! The ride in question is located at the end of Fantasyland, and fitted out with small boats which travel at a walking pace through many colorful scenes, all the while followed by a cheery tune. I will beg the pleasure of their company again tomorrow, perhaps with a more agreeable outcome. Although the United States at large is suffering through an economic downturn, there was no sign of this condition within the walls of our Mickey’d microcosm. There were many, many visitors … all wearing the requisite themed clothing, and all eating the high-priced fare offered for consumption. By mid-afternoon, the cheery army who defend this vast territory were out in force, directing pedestrian traffic with flags and determined good humor. The Mouse was angry today. He called down upon his pilgrims a plague of rain. Those who failed to secure indoor seating were driven out of doors with their breakfast … where raindrops slid down hastily opened umbrellas and bounced onto bacon and eggs. Do not trouble with the rain gear. We have purchased ponchos at a local shop. Despite my vow that I would awaken the members of our party each morning with a warbled, “It’s a small world after all … it’s a small world after all …” my group remain steadfast in their refusal to enjoy this enchanting ride! I must report that one member offered a second the payment of $1 US to accompany me, so that he would not be obliged. A long-time friend, L, and her two lovely children joined us today. I feel quite emotional when I think of the many joys and sorrows we have shared during our years of friendship. L’s daughter is a smart, sociable 12-year-old, sharing Disney trivia and her list of favorite books. L’s son was a baby last time I saw him; now he is 10, with L’s beautiful brown eyes and a shy smile. After an hour or so, our group split up – boys to stand in line for Splash Mountain, girls to head happily for the much-maligned boat ride through singing-and-dancing dolls. We made an unscheduled stop at the Tiki Room first … where forty-year-old mechanical birds and flowers are are still crooning tunes. At last we reached our destination. The journey through various miniature worlds was as pleasant as I remembered. Midway through, my cell phone vibrated. I could see that it was my husband calling. Not wishing to disturb others by talking on my phone during the ride, I answered the call without speaking, and held the phone up, so that my husband might enjoy the music. When we reunited as a group, I collected the $1 that rightfully belonged to L.
More determinedly pleasant crowd control. A spectacle of lights, fireworks, music, actors, and dancers was brought forth for the faithful. Then we fell into bed, and dreamed of mouse-shaped food. It is time to leave this place. We have wrung from it all possible enjoyment, and now risk the Great Crankiness. As a matter of fact, as we posed in front of a mass of colorful balloons while a kindly stranger took our photo, my dear husband ventured to wonder if we should include Sleeping Beauty’s Castle in the background. The field notes end here … pages torn from a notebook, but transcribed for posterity by your humble servant. Yes ... it is a small world, after all. I loved this! It's been many years since I went to the Land of the Great Mouse, but the place of many boats was always my favorite. Thanks for the lovely descriptions! Perhaps one day you will trek to this exotic land with Mr. Darcy. 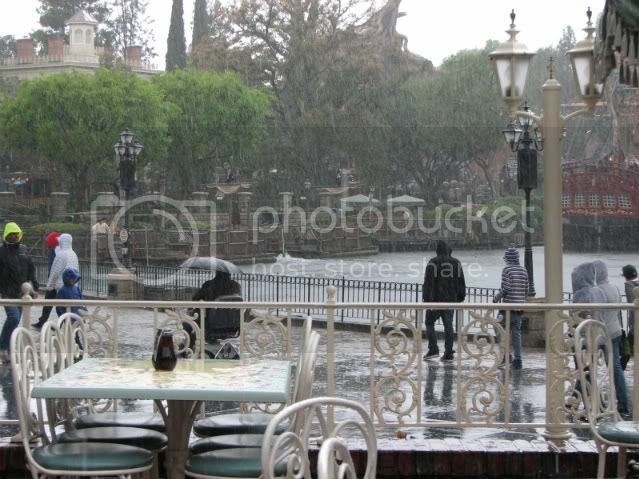 I have never seen a picture of rain at Disneyland. That is AWESOME. I had to smuggle it out of the compound at great personal risk. He called down upon his pilgrims a plague of rain. The boat-ride-which-shall-not-be-named is a required ritual when in the Land of Mouse...if one does NOT partake, what mousy wrath awaits? Kudos to you for keeping the faith! And oh, the Great Crankiness...sounds like you all escaped just in time.